Hiring highly qualified people is crucial to every company, and Background Screening and Investigations is an essential guide to succeeding in a turbulent business environment. A crucial part of any hiring process should be employment background screening, pre- and post-hire, which gives hiring personnel a glimpse into a person's past behavior patterns, propensities, and likely future behavior. Background Screening and Investigations describes all aspects of the employment background screening processes - its history and evolution, the imperative for implementing a screening process, and the creation of a comprehensive policy. 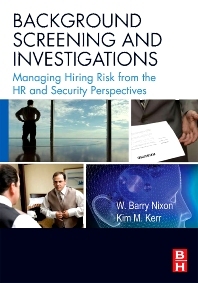 Nixon and Kerr show how security and human resources professionals can work together to negotiate legal hurdles and make their background screening process successful. Where do HR and security perspectives differ on hot topics like hiring convicted felons, data protection, and sexual predators? What does state law allow when screening job candidates? How should companies deal with emerging issues like international background investigations and continuous (Infinity) screening of current employees? Security managers, security consultants, Human Resource professionals, threat management teams, legal professionals, and risk assessment professionals.